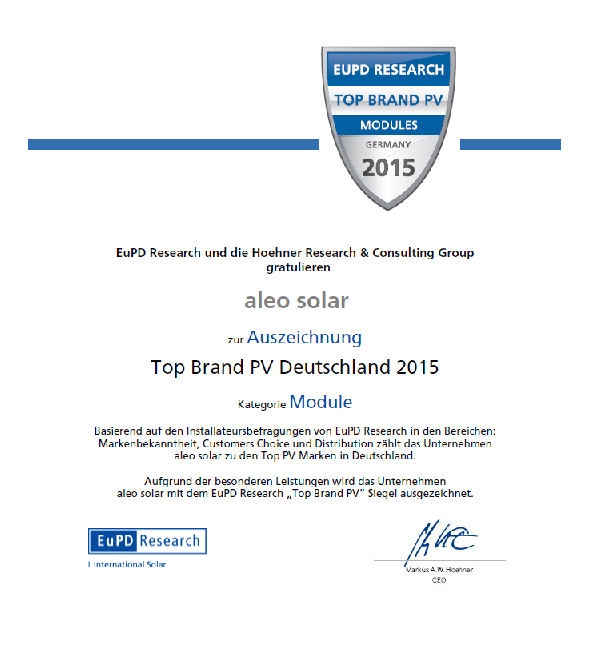 Aleo Solar GmbH is awarded TOP BRAND PV seal of approval « SP Green Energy Ltd.
Just a few months after the beginning of our cooperation with Aleo Solar GmbH and their worldwide recognition as top quality photovoltaic modules produced exclusively in Prenzlau, Germany it is our honor to announce the presentation of the award TOP BRAND PV 2015 for Aleo Solar GmbH. 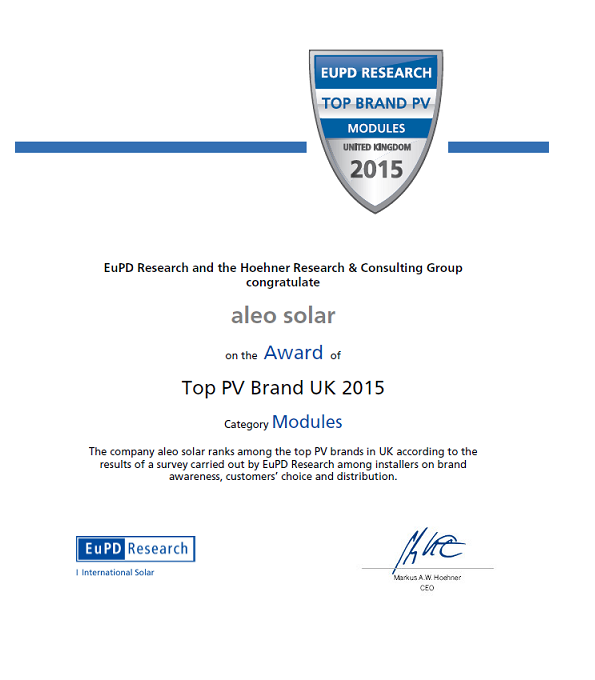 The TOP BRAND PV seal of approval is awarded after extensive research conducted by the internationally recognized institute EuPD Research in the photovoltaic industry professionals, especially in the most competitive markets in Germany and the United Kingdom criteria such as the quality components, the performance of photovoltaic modules and the after sales service and support. 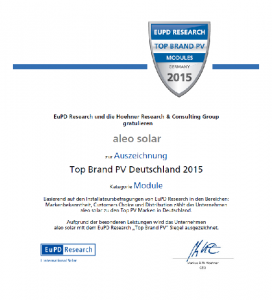 The world famous award is confirmation of our ongoing efforts to support you with Photovoltaic panels that are truly 100% Made in Germany, have high performance, are of top quality, have the right price and are supported by reliable after-sales services. Now accompanied by TOP BRAND PV seal of approval. Staying true to our values ​​for the supply of reliable solutions, we encourage you to take into account of the competitive advantages that we offer in cooperation with Aleo Solar GmbH. Available in our warehousing facilities in Limassol and Nicosia.